Social Justice in English Language Teaching is a collection of chapters about various identities (linguistic and non-linguistic) and aspects of social justice (e.g. human rights, peace, global citizenship, environmental issues). The book is divided into seven parts: ‘Social Justice and English Language Teaching’ (the introduction); ‘Peace building and English Language Teaching’; ‘Positioning for Advocacy’; ‘Language rights’, ‘Privilege, and Race’; ‘Gender and Sexual Orientation Justice’; ‘Working Across Borders/Advocating for Students’; and ‘Classroom Practices’. The twenty-two chapters are written by a variety of ESL educators and professors with different backgrounds, lived experiences, and personal encounters with marginalization. The writing in the book is accessible without losing an academic feel. A social justice related background is not needed in order to comprehend the book effectively. The avoidance of dense sentences and complex vocabulary makes the book more approachable to a general academic audience; moreover, chapters can be read independently. If one does not have a background in social justice. However, I would recommend reading chapter one (Charles Hall) before moving onto other chapters, as it provides good scaffolding for the other chapters in the book. A particular strength of this book is its combination of theoretical background, historical and cultural context, and practical application. Although this book contains a three-chapter section titled ‘Classroom Practices’, teaching techniques catering to social justice are woven into many of the chapters. Even though some of the chapters do not appear to aim to give concrete teaching tips, ideas for implementation in the language classroom can easily be lifted. Chapters of the book complement other chapters well. For example, chapter 16 by Carter A. Winkle, provides an ethnodrama of six LGBTQ TESOL educators who have been marginalized in their professional, academic, and social lives. Another chapter, written by Alexis Gerard Finger, focuses on using drama as a tool for creating social change. This is an obvious example, but several connections between chapters can be made throughout the book, especially with regard to themes such as privilege, power, and intersectionality. I wonder about the applicability of some of the teaching techniques in settings outside of Anglophone countries. Would certain cultures not be welcoming of critical pedagogy? Would they be welcoming of identity research? Would they be interested in reading a play about members of the LGBTQ community? As a critical English educator, I want to believe that there are ways to discuss any topic, and I am sure others would agree. Fortunately, in chapters that do elaborate on teaching practices related to social justice, the authors are careful to mention how strategies work in their own contexts or invite teachers to think about how to use their strategies in their own teaching contexts. The book costs about $60 if purchased from TESOL Press, the publisher. Members of TESOL International Association can acquire the book for a little less than $50. Some teachers might find this expensive, but it is a good investment for ESL educators who wish to create meaning change within their classes! 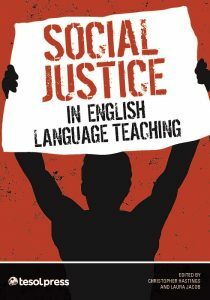 To my knowledge, Social Justice in English Language Teaching is the first collection of writings about social justice in the field of TESOL. A collection like this is bound to encourage teachers to pursue ethical practice in the ESL/EFL classroom. For GISIG members, this book is certainly essential as a reference to centre our work in theory, for integrating social justice activities created by professionals, and to promote ideas of social justice, equality, and equity in our classrooms!